Here's a small tool similar to Kelly Michels "Nitrous Set Texture Size Limit" script. It's a standalone spawn-off version of a tool that is integrated in the upcoming PowerPreview release. Since Kelly's tool misses some features and is not fully 3ds Max 2012 compatible, i decided to rip my tool out of PowerPreview and make it available as a standalone version. I think the screenshot is pretty self explanatory. The script is FULLY compatible with 3ds Max 2012 and up. For installation, open it in the Maxscript Editor and press "Evaluate" ( Ctrl-E ). After that, you'll find it in the "Customize User Interface Dialog" in the "Spacefrog Tools" - category. 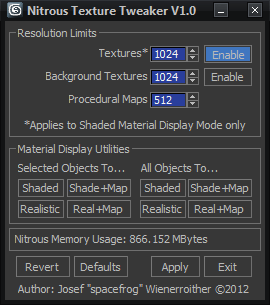 Simply map "Nitrous: Viewport Texture Tweaker" to a keyboard shortcut, menu entry or button as usual. Map display modes might fail on some material types, like "Shell Material" etc..
As usual: critics, feedback, problem reports are welcome ! Submitted by spacefrog on Mon, 2012-10-01 06:55. Submitted by spacefrog on Mon, 2012-10-01 06:25. Submitted by Jonathan de Blok on Mon, 2012-10-01 05:44.